Meet our spiritual leader, Rabbi Karen Allen, who sends a warm welcome and greetings to all who wish to join with us in prayer, in service and in fellowship. Rabbi Allen is dedicated to the survival of Judaism in the world. She believes there is a contemporary expression of Judaism that is perfect for each Jew and for each congregation, and is committed to providing something of value to every person attending a service. 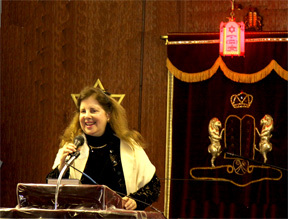 Her calling is to serve the L-rd with gladness, and to lead others in finding their joy through worship and through crafting the evolution of their own uniquely Jewish lives. Rabbi Allen has served as Rabbi, Cantor, organist, choir director, vocal soloist, worship leader, and director of music in synagogues and institutions of virtually every denomination. She is a wedding specialist and a hospice and hospital chaplain. Rabbi Allen is by nature an encourager and healer. She enjoys serving as a partner in both the growth of the congregation and the personal spiritual journey of each congregant. At Congregation Beth Sholom, you will find a friendly and caring atmosphere in which to celebrate Shabbat and holidays, and to commemorate significant life events. Rabbi Allen invites you to join us as we explore together the meaning in our own lives of the weekly Torah readings; the fun of sharing food and friendship; and the joy of getting to know one another through doing good in the world.